At the very end of Jerome’s chronicle, after the narration of events has stopped, time is tallied up: “The whole list (canon) from Abraham until the time written above, 2,395 years. And from the flood until Abraham there are reckoned 942 years. And from Adam until the flood, 2,242 years. From Adam until the fourteenth year of Valens—that is, his sixth consulship and the second of Valentinian—all the years were 5, 579” (my translation, Latin in Helm, ed. Eusebius Werke 7). Jerome, having reached the end of historical time, suddenly retraced his steps backwards, from landmark figure to landmark event back to Adam. Chronicles are difficult but rewarding sources. Environmental historians have found their laconic comments on crops and weather helpful, and historians and literary scholars have long debated the meaning of the “fiery dragons flying across the firmament” in the entry for 793 in the Anglo-Saxon Chronicle. Every entry can be unpacked for further meaning. In this post, I want to think about the ends of chronicles, especially that of the chronicle that became the beginning to many continuations, through the middle ages and into the early modern period: Jerome’s Latin Chronicle. Jerome’s own chronicle is itself a continuation: he translated the Greek chronicle of Eusebius of Caesarea, which had ended in 325, in the reign of the first Christian emperor, Constantine—a Christ-like figure for Eusebius who ended persecution and ushered in a new era of Christian world history. (It should be noted that neither Eusebius nor Jerome used AD dating—those dates have been added for the convenience of the reader by modern editors.) Although Jerome had inserted details, especially Roman historical events, into his translation from the fall of Troy onwards, at the end of Eusebius’s chronicle he took over: “Until this point Eusebius Pamphili, companion to the martyrs, writes this history, to which we ourselves have appended these things following” (year 326). Jerome updated Eusebius’s chronicle, taking it up to the year 378, to the disastrous Battle of Adrianople and the death of the Emperor Valens. Jerome’s vision of history thus had a very different shape from that of Eusebius, who had ended his work of providential history triumphantly. Jerome’s depressing ending was deliberate: he was writing in 381, yet he chose not to continue the chronicle up to the present day. In the preface to his work, he wrote: “Contented with this end-point, I have reserved the rest of the time of Gratian and Theodosius [the current emperors] for the pen of a broader history; not that I have been afraid to write freely and truly about living persons—for the fear of God drives out the fear of men—but because while the barbarians are still raging here in our land, all things are uncertain” (preface). Aside from the barbarians, Jerome was still unsure what to make of Theodosius. 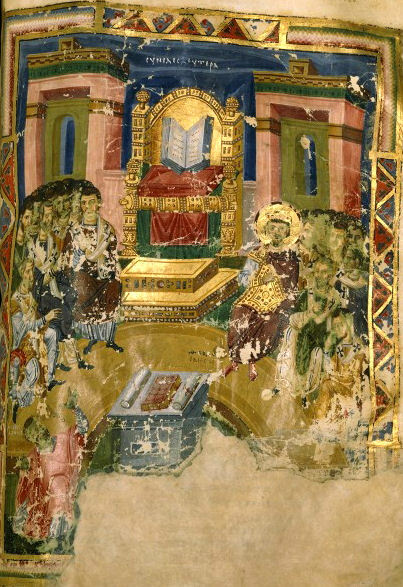 In 381, both were at Constantinople for the church council that the emperor had convened, and Jerome was watching that first Council of Constantinople closely to see where Theodosius’s ecclesiastical loyalties lay. Jerome’s calculation of years from the beginning of time was thus deliberately outdated, in part to avoid treading upon delicate ecclesiastical and political terrain. But it also did precisely what Eusebius had avoided: it enumerated the years since the Creation. Of the major world chronicles composed between the third to tenth centuries, Eusebius’s is the only one that does not begin at the beginning (McKitterick, Perceptions of the Past, 9). Instead, his history starts with Abraham, in order not to give substance to those who, relying upon a particular interpretation of the book of Daniel, thought that the world would end after six thousand years (Grafton and Williams, Christianity and the Transformation of the Book, 153). While Jerome, too, began with Abraham and did not add the history between Adam and Abraham to the Chronicle, he nonetheless went back to the beginning at the end of his work. Even in the first major Latin chronicle, we can see that the end of a chronicle asks the copyist or continuator to make decisions about the presentation of time and history. The end of a chronicle could be fraught with tension, as the continuator implicitly commented on the politics of the present as well as the intentions of the original author. In a ninth-century copy of Jerome’s chronicle, the copyist at the monastery of Reichenau in Germany decided to keep Jerome’s computations exactly: he did not alter or update the text to reflect the years that had passed (Merton College MS 315, 149v). Nonetheless, he added a list of rulers and their years to the back of the manuscript, perhaps to aid readers looking for specific events in the chronicle itself (149v – 155v). On the last page, he also added a calculation from another late antique chronicler, Africanus, to provide yet another estimate of the world’s age in late antiquity (156r). Yet this copyist was unusual: many others added their own times to the end of the chronicle they copied. The end of Jerome’s Chronicle and the beginning of Prosper’s in Estienne’s edition (1518). Bayerische Staatsbibliothek. When Henri Estienne printed the chronicle in 1512 and 1518, he titled it: The Chronicle of Eusebius bishop of Caesarea, which the presbyter Jerome translated into Latin with divine genius, and added with Roman eloquence until emperor Valens. To which Prosper and Matteo Palmieri have added much… (my translation; 1518 edition). In this edition, the end of Jerome’s version is announced after his account of the Battle of Adrianople and Valen’s death, and Prosper’s chronicle continues until the humanist Palmieri’s takes over. Estienne skipped Jerome’s calculation of years from the beginning of time to the end of his chronicle. 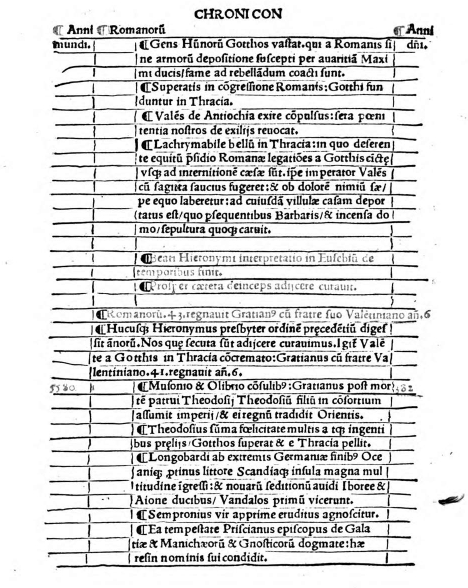 Nonetheless, running alongside the text in Estienne’s edition are “anni mundi,” the years of the world, and these tally exactly with Jerome’s own computation, so that when Jerome’s chronicle ended in 5, 579, Prosper’s picked up in 5, 580. Continuators of chronicles changed and maintained the temporal schemas of their predecessors in myriad ways, and one of the best ways to see where chroniclers thought time began and ended is to look to the end of one chronicle and the beginning of the next. Thank you so much for passing that along! Love the sentence about Jerome as a troll–perhaps apt that he’s taking over the internet this week. Long ago, Lisa Jardine argued in her groundbreaking Erasmus, Man of Letters, that when Erasmus identified his own persona with that of Jerome, he was making a move in a literary field, consolidating his own authority as scriptural scholar, master letter-writer and more. This argument received a lot of push-back from some excellent scholars, such as Mark Vessey, Andre Godin and Hilmar Pabel–not to mention my former student Nicholas Naquin–who argued that she greatly underestimated the Christian element in Erasmus’s thought. But if Andrew Cain is right, then Jerome was already using tactics like those that Jardine ascribed to Erasmus. Yes, there is a wonderfully German edition of Lurher’s notes, marginal slash by marginal slash. Some of his comments are great fun.